The majority of the militia are designated as Musketmen and carry reproductions of either the English 2nd Model Brown Bess or the French 1768 Charleville flintlock muskets. 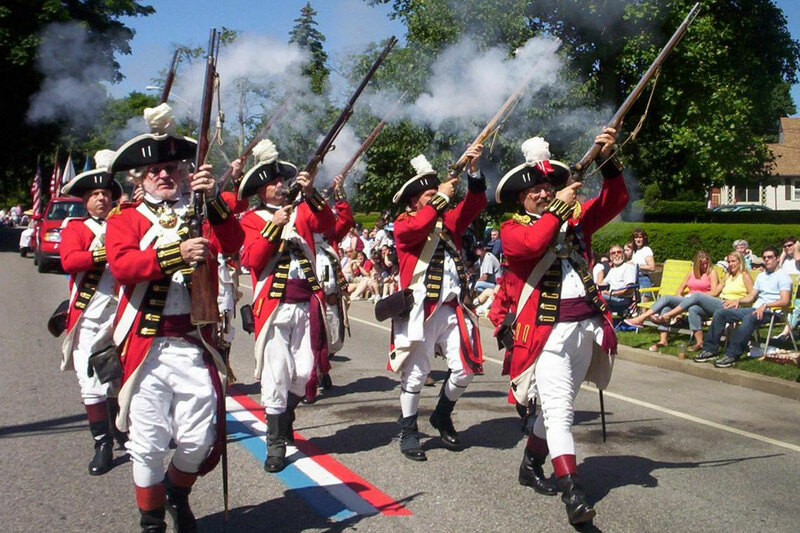 Whether firing on the march during parades and musters, demonstrating the manual of arms at encampments or “fighting” in a re-enactment, the Rangers fire black powder blanks. However, as members of the Rhode Island Militia, each year we participate in live fire qualification and competition at Camp Fogarty. Despite firing smooth bore flintlocks which were and still are notoriously inaccurate, the Rangers are always strong contenders for the Governors Cup. In our scarlet coats we add color wherever we go, our muskets bang and belch smoke & fire to the delight of all those watching. Contact us if you are interested in having the Pawtuxet Rangers serve as honor guards, fire a ceremonial salute, or demonstrate this unique piece of American history.